England thrashed South Africa by seven wickets at the Wanderers to take an unassailable 2-0 lead in the series and knock the Proteas off the top of the Test rankings. For South Africa, the disappointment is three-fold. They have lost the third Test to England in humiliating fashion. They have lost the four-game series. Worst of all, they have surrendered their No 1-ranking in Test cricket. Following England’s crushing win at the Wanderers, South Africa will drop down the ICC ladder. India are now the No 1 Test side in the world. The Proteas should have no argument. On the basis of their recent performances, they have no claim to the title of world’s best. They were poor in the first Test at Kingsmead, and abysmal in the third Test at the Wanderers. Not for the first time in the past 12 months, the Proteas’ batting was spectacularly bad. There should be criticism of the Proteas players and management for allowing the standards to slip to such an unacceptable degree. At the same time, there should be praise for an England side that has been nothing short of outstanding over the course of the first three Tests in this series. There have been moments in this series where South Africa have been competitive. Indeed, they did well on the morning of day three of the third Test to fight back and limit England to 323 and a moderate lead of 10 runs. The Proteas would have been encouraged by the performance of 20-year-old Kagiso Rabada, who led the way in that session and finished with career-best figures of 5-78. Rabada has given South African supporters some cause to believe that the future may not be so bleak. But as has so often been the case in recent times, the batsmen let the team down. 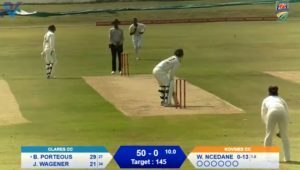 None of the South Africans scored a half century in the first innings at the Wanderers. In the second dig, Rabada, a specialist bowler, top-scored with 16. The Proteas should be criticised for their lack of temperament at the Wanderers. They should be condemned for the inability to construct partnerships of substance. It’s become something of habit. In the last five Tests, South Africa have lost five wickets for 12 runs or fewer on four separate occasions. 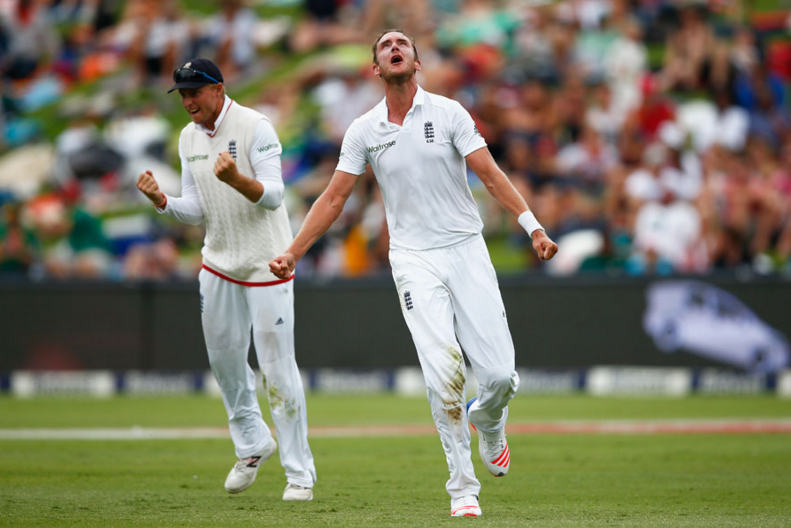 Take nothing away from England, and Stuart Broad in particular. In the period after lunch on day three, the tourists were buzzing with intensity. Their bowlers hit the right areas and their fielders made the most of every chance. The overcast conditions and considerable seam movement at the Wanderers played a part, but Broad still had to make that advantage count. First to go was Dean Elgar, who couldn’t resist sparring at a delivery outside off-stump. Then it was Stiaan van Zyl, who seemed destined to perish after playing and missing repeatedly. The opener eventually found the edge and Ben Stokes made no mistake in pouching the catch at slip. When Broad had AB de Villiers caught behind for 0 thereafter, the England team celebrated wildly. Two overs later, Broad had accounted for another key man in Hashim Amla. James Taylor should be credited for an amazing reflex catch at short leg. Temba Bavuma was next to depart after playing the ball on to his stumps. In little over an hour after the break, Broad had taken 5-14. Taylor was in the mix again when he dived to his right to dismiss Dane Vilas. The South African wicketkeeper-batsman hit the ball well, and Taylor did an outstanding job to hang on to the half-chance at short leg. Stokes produced the delivery of the day to breach Chris Morris’s defence, and then ended Rabada’s resistance on the stroke of tea. The Proteas limped to the break with only two wickets remaining and a lead of just 61 runs. South Africa lasted 4.1 overs after tea. Fittingly, it was Broad who claimed the final wicket. Faf du Plessis attempted to take the bowler on, but only succeeded in getting a leading edge. Broad charged forward to complete a difficult caught and bowled chance. England then proceeded to compound the Proteas’ woes by knocking off the required runs in less than 23 overs. South Africa’s humiliation was complete. It will be interesting to see how the hosts react in the fourth and final Test. They cannot win this series. And yet the Proteas will have plenty to play for. They lost their last Test series to India 3-0. They will not want to suffer another 3-0 hammering, this time at the hands of England. They will also be looking to score their first Test win in more than 12 months. Another draw or a loss at Centurion will stretch the Proteas’ winless run to 10 matches.